I said I’d keep you posted on my uric acid levels so here is an up date. I started taking 100mgs of Allopurinol on the 3rd of Sept 2012 . On the 17th, a fortnight later I had a blood test for uric acid , kidney function and liver function as you advised. 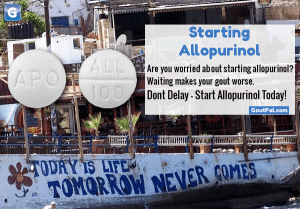 During the first two weeks of the commencement of Allopurinol I encountered a flare up of gout ( 5 days in to be exact ) so I started Colchicine Immediately , one per day , which stopped it in its tracks. My uric acid level before starting Allopurinol was 448 and I am delighted to say they are now down to 290 . Yippee! I was so pleased with the result but then I was somewhat deflated when the nurse said I would need to have a liver function re test ? I didn’t ask her why ? I just made an appointmet for retest on Wednesday. I just hope that one will be ok ? This entry was posted in Favorite Gout Topics, Gout Remedies Forum For Gout Treatment and tagged When to start Allopurinol, Xanthine Oxidase. Bookmark the permalink. The 290 μmol/L is a great place to be. That shows that allopurinol is at the right dose for you, and you can look forward to getting rid of the old uric acid crystals. It is a little disheartening to be asked for the liver function retest, but better safe than sorry. If it proves to be a problem, you could always try febuxostat. I can understand the deflated feeling, but on the bright side, you have got gout under control, and you have options for the future. Gerwyn, rather than feeling deflated/disheartened you ought to be elated/heartened that you have a medical caretaker who is “caring” for/about you. You should have regular “complete metabolic panel” tests when you are on gout medication since they can/may affect liver and kidneys. Those tests will show the doctor if you are OK. Once you have your gout under control, and please, don’t think that two weeks, or for that matter, two months will be sufficient to prove that, a once a year test should suffice, unless you have other medical problems. Thanks Keith and thanks hansinnm for the kind words and support . Here’s to Wednesdays blood test, got a feeling that everything will be fine. I had a kidney and liver function test a few years back and everytrhing was ok then. I’ve been taking Glocosamine and Chondroitin for osteoarthritis of the knees ( not sure but it may be gout that caused it ? ) since May 2012. I’ve read a few forums where people on this supplement have developed liver problems as a result ? so I,ve stopped taking them as a precaution untill the blood test on Wednesday. Wish me luck guys ! I will let you know as soon as I know. Shameless UK affiliate link: http://www.amazon.co.uk/Glucosamine-Sulphate-500mg-Chondroitin-400mg/dp/B004TAFCY6/ or search amazon.com outside UK. Maybe it is best to drop all supplements until tested. Then, if all clear, re-introduce before next blood test. Best to discuss with doctor first. You are a mine of information. so Chondroitin seems to be the safer option ? I will , as you say, refrain from any supplements untill tested. I will keep you posted. Some strange developments have occured ? My right knee is stiff and swollen ( difficult to bend or straighten ? ) My left foot on the outer side is painful ? Also from the top of my back thighs just below the buttocks there is pain going down the backs of legs. Had a bit of a ruff night last night , couldnt sleep because of the pain and discomfort ? I’m struggling to walk today ? I stopped all supplements last Thursday including Glocosamine and Chondroitin although I’ve continued to take Allopurinol 100mg once a day . I’ve got my repeat blood test tomorrow 10am. I’ve rang the Doctor and made an appointment for 2.10 pm today. I’m going to ask him if he will refer me to a Rheumatologist. I’ve got to get this sorted ! Do you think I may be experiencing Allopurinol side effects ? I’ve read the leaflet . It mentioned joint pain but I have had no problems up to now ? I’ve been taking Allopurinol for 23 days. Forgot to mention , my knee started stiffening up over the weekend. Any Idea’s Keith ? Have you had any similar stories like this ? I’ve been a little busy lately, and you’ve probably seen the doc by now. My initial reaction is the fairly common pain from old crystals dissolving. What did your doctor say? Sorry about the delay in Getting back. The kick start on the computer went or something like that? Anyway I went to see the Doctor on the 25 September and asked him if I could be referred to a Rheumatologist and he sort of laughed a bit and said , It’s a very long waiting list and it will take ages to see one .If I can’t sort it then we’ll consider that route . He examined me knee , which was quite swollen , hot and painful and he said It’s quite swollen and hot and is it painful ? I said yes. He prescribed me more colchicines and I struggled out of the surgery . I was in so much pain, I could hardly walk , also I hadn’t taken any pain relief or Indometacin which made matters worse. The reason being I had my blood retest the following day and I didn’t want any medication affecting the result .The only thing I was taking was the 100mg of allopurinol daily. I had also stopped taking supplements. She said , giving birth is worse but I couldn’t really comment on that? The next day , after my re test I went back on the meds and supplements and things started to ease and eventually got back to sort of normal? The good news I’m glad to say is that the re test turned out fine , everything ok .Thank God. I’ve had a few flare ups in my left ankle since ( the 10th and 11th Oct ) and I’ve got a flare up in the left ankle right now. Do you think I should have another uric acid test to see if my levels are still under 300 umols/L or shall I wait a while ? I know It’s hard to say but what is the average length of time until all the old crystals have dissolved and disappeared or is it a “how long is a piece of string” sort of question ? Also I’m thinking of getting a uric acid test meter? What you reckon? Sorry It’s such a long post but I wanted to get all the information In because It’s been a while. Cheers Keith , look forward to your reply. Good to hear from you Gerwyn, though I’m concerned at your treatment. Rheumatologists should not be necessary in straightforward cases, but if general practitioners don’t read the guidelines…. Anyway, I’ll come to that in a moment, but first the childbirth issue. This has been mentioned a few times, and I will summarize the points that have been made in a new post, later. The jury is out, but it is looking like a fairly even balance between those who say gout pain is worse, and those who say it is a close second. What really matters is the sufferer. None of the pain medications in that article should affect gout-related blood tests. Of course, it is wise to advise your doctor of any medicines you are taking, but you should not have to endure pain just to get a blood test. Neither should you need to endure pain to achieve safe uric acid levels. It is common practice to prescribe preventative pain relief during the early months of uric acid lowering treatment. My advice is to aim to get uric acid as low as possible, to minimize the period of time that you need pain relief. My course of action is hinted at in the latest American gout guidelines (currently discussed in the symptoms forum). Those guidelines emphasize the concept of treat to target. Treat to target is also clear in the British Guidelines – confirmed gout patients should not allow their uric acid to rise above 0.30mmol/L (5mg/dL). I am putting the onus on the patient here, as it is clear from my experiences, Gerwyn’s experiences, and several of my friends, that doctors are unaware of the professional gout guidelines. Doctors can choose to risk their professional reputations by ignoring guidelines if they wish. We, as gout patients, should not risk our health. Therefore we should agree on a target, and we should encourage our doctors to treat to that target. I agreed a target of approx 0.20mmol/L (approx 3.5 mg/dL) for 12 months, and this has just been extended for a further 12 months based on the still-visible tophi, and the fact that I have consistently returned good kidney and liver function blood test results. Other gout patients may not wish to be so aggressive, but the maximum is 5mg/dL, which might be relaxed to 6 where other health problems present specific difficulties (that is specific as in case-controlled – *not* an excuse for poor personal gout management). My views on uric acid test kits, are hopefully clear. I believe it is your doctors responsibility to provide adequate uric acid test results. By adequate, I mean at least once per year, but more frequently, up to once a month when treatment is started or changed. Adequate also means an exact number including the scale. It is the patients responsibility to make themselves available for the tests, and to keep a log of the results so that they are always aware of what their number is, and what their target is. For some people, blood test visits can be awkward. It might be location, or it might be poor doctor relations (which you should strive to fix). Other gout sufferers want the peace of mind of daily or weekly data. In either of these situations, I know that uric acid test kits are a good idea, but you *must* be methodical. The technology of a properly functioning meter is accurate, but the procedure is dependent on consistent blood droplet size. You really must have that type of personality that can adopt a scientific state of mind. That means consistency. I used to feel a bit “OCD” about my procedure, as it involved exactly the same preparation and process, only varying which finger I pricked. Same time, same seat, same order of setting out equipment, etc. Possibly extreme, but I take a similar approach to making tea. You may not need to be quite so controlled, but if you are haphazard, you will get haphazard results. One thought always kept me going during the early stage of allopurinol, though this entirely depends on knowing your uric acid number. At the time I was on what the experts call titration. You start with the ultra-safe 100mg allopurinol per day; get a blood test, including liver & kidney safety checks; titrate the dose up; test; repeat until target uric acid is met. So my thought was: I have gout pain, but I know that with my current uric acid level, it cannot be new crystals forming, so it must be old deposits dissolving. Not unlike childbirth, the results of that pain are worth it. Once again your knowledge and advice is proving invaluable in my quest to control and beat gout. If I continue at this dose will the uric acid levels remain at this low level or do they fluctuate and if they do , do they fluctuate a lot or a little ? depending on factors such as diet,stress,dehydration etc. Also, have you come accross any information on Rose Hip supplements as an aid for gout? 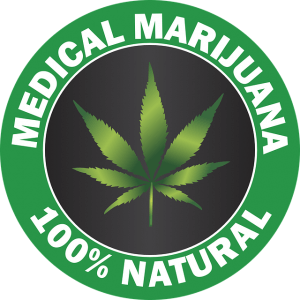 The reason I ask , I bought some a while back because there are a lot of reports that it is good for osteoarthritis,which I have in both knees. 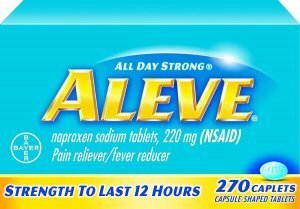 I’ve taken and stopped taking them twice because each time , after taking them I’ve had a gout flare up? Once before I started Allopurinol and once whilst taking Allopurinol ? I was thinking maybe It’s the tomato situation all over again , where it drops uric acid levels and causes a flare up? I don’t know its just a thought ( in layman’s terms). What is 290 umols/L in mg/dL ? I can’t seem to find the calculation formula ? Uric acid crystallizes around 400 µmol/L. I do not know what the maximum variation is, but I would think you are safe from every possibility. If you want to minimize the risk of flares, then a few months around 200 will do that. It is very difficult to guess the specific reason for any gout attack, and impossible if you start and stop allopurinol. That is why I say every gout sufferer needs a treatment plan. During the first few months, you are causing uric acid crystals to dissolve. The faster they do so, the less chance they have of causing a flare. My logic tells me that the sensible solution is to max the allopurinol to min the risk of flares. 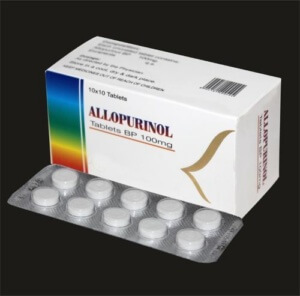 Allopurinol will still work if you stay at or below 300 µmol/L. At that level, you are completely protected from new crystals forming. Apart from general health issues, you can forget the diet restrictions (it would be rather foolish to die from a heart attack from eating steak and seafood feasts, just because they can no longer cause gout). To summarize. At 290, you are safe from new crystals forming. You will remain at risk from random attacks until most deposits have dissolved. Without access to a DECT machine, there is no way to assess how long this will take. The only certainty is that a lower uric acid level will shorten the time period. When you do find it, you will need to use 0.29 mmol/L, as I did not want to complicate the uric acid calculator with a third scale. Don’t worry about the formula Keith, I just found it . It was staring right at me ! According to me It’s 290/59.48= 4.87mg/dL ? If that’s the correct answer is it too high ? 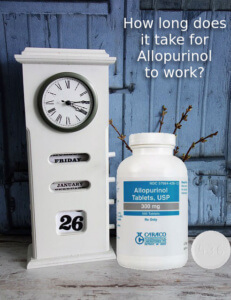 How long does it take for allopurinol to work? It depends on your personal circumstances. So, tell me your gouty details, and ask in the gout forum.